Santander family and friends may God grant you all with a speedy healing. Officer Santander thank you for your service to your Community and to your Department. Most of all thank you for your Ultimate Sacrifice in the line of duty. We have your patrol from here, Corporal Eugene Cole. Rest easy, our Brother-in-Blue, you are now in the hands of the Lord God. 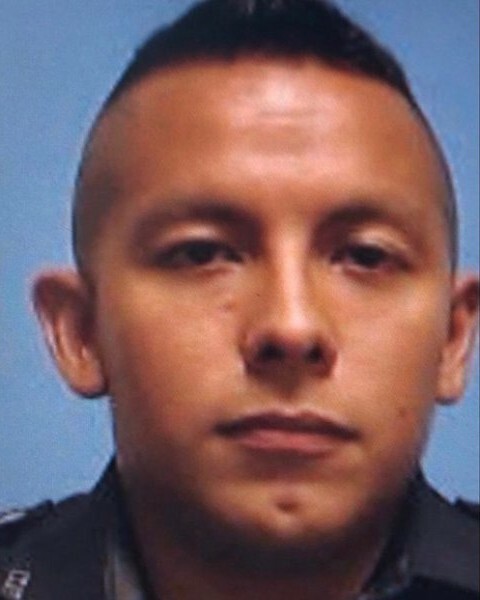 RIP Ofc Santander, and prayers for your partner and the other victim of this terrible crime. My heart aches every time I hear that another brother or sister LEO falls in the line of duty especially at the hands of another. I pray for healing and comfort for your family, your department, and the citizens of the community that you served. Rest In Peace Brother in Blue. Thank you and your family for your sacrifice and service. Thoughts and prayers for your family, friends and brother and sisters in Blue. Thank you for your service sir...We will take watch from here. TO THE FAMILY, FRIENDS AND COLLEAGUES OF DALLAS POLICE DEPARTMENT, POLICE OFFICER ROGELIO SANTANDER, I.D.#10934. We in the law enforcement community are a family, although our uniforms may be a different style and vary in color, a badge, shield or star may be pinned upon our chest. Our areas of enforcement may vary but our goals are the same, to Serve and Protect our communities. We consist of many different agencies from across the nation, for we are: Municipal Officers, Sheriff’s Deputies, State Police Investigators, State Highway Patrol Troopers, Conservation Police Officers,College Campus Police Officers, Correctional Officers and Federal Agents just to name a few. Daily we honor our fallen brothers and sisters never forgetting their sacrifice and the sacrifices of their families. Daily we show pride in our chosen profession LAW ENFORCEMENT, for we willingly walk the line of good over evil facing the unknown with courage keeping our trust and our faith in GOD. You sacrificed your life in the service to the citizens in the City of Dallas, State of Texas with HONOR, PRIDE and DISTINCTION. I’m proud to have pinned the badge upon my chest like you. I commend you my fallen brother for making the ultimate sacrifice in the performance of your duty,. Honor and Pride making a better and safer place for us all. Attention All Units....................Dallas Police Department, Police Officer Rogelio Santander, I.D. #10934 having served the citizens in the City of Dallas, in the State of Texas with HONOR, PRIDE and DISTINCTION is now 10-42. Final Salute Officer Santander. Thank you for your service. You are a hero. Rest peacefully in the presence of God. We are praying for the family and fellow officers. Rest in Peace Brother. We got it from here! Thank you for your service. Prayers are being sent up for your families, at work and at home. God Speed Brother. Rest In Peace Officer Santander. My heart goes out to the Dallas police department and the family. Heartfelt prayers for you all. Ever since the death of Deputy manning i've stood behind all LEO like i've never before my God comfort y'all in grief. In honor to my cousin Josh woodard former LEO wilson,nc P.D. RIP My Brother in Blue. You served well. You will never be forgotten. We have the watch from here. Rest in peace young brother. Thank you for your service, we'll take it from here. God bless the family, friends, and co-workers of Officer Santander during this time of tragic and senseless loss. May you Rest In Peace Officer Santander. Thank you for your service.